The Windsor Police Service is set to jack up its armoury. 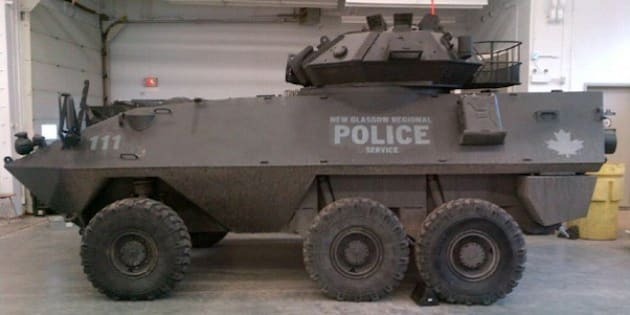 Police in the southern Ontario city will take a Cougar, a light armoured vehicle donated by the Department of National Defence (DND), into service next month, CBC News reported. Windsor police Sgt. Matt D'Asti said that the vehicle, which has never been deployed, is needed for situations such as an "active shooter," a barricaded gunman or hostages. "It's not something that's meant to be offensive, it's not something that we're patrolling the streets with," he told the network. The vehicle comes after the police force replaced its 12-gauge shotguns with C8 patrol carbine rifles last year, said CBC. Those weapons are similar to M16 rifles and shoot more precisely than the force's previous guns. Police said at the time that the new rifles would only be used in dangerous situations, though eventually they would be present in all patrol cars. 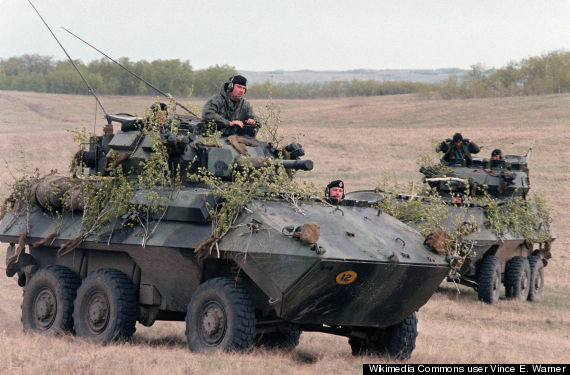 The Windsor police are hardly the first force in Canada to add military vehicles to its ranks. The DND has donated five armoured vehicles to police departments in the past seven years. Among them, the Edmonton police took a Grizzly in 2007; the RCMP in B.C. received two Cougars in 2010; and the New Glasgow Regional Police Service in Nova Scotia obtained a Cougar alongside the Windsor police in 2013, Postmedia News reported. Police in Ottawa and Saskatoon have also purchased BearCats, armoured vehicles that are popular with the U.S. Department of Defense, according to Lenco, their Massachusetts-based manufacturer. Officers in Ferguson, Mo. have been criticized for using BearCats to respond to protests that have followed the shooting death of teenager Michael Brown, CNBC reported. 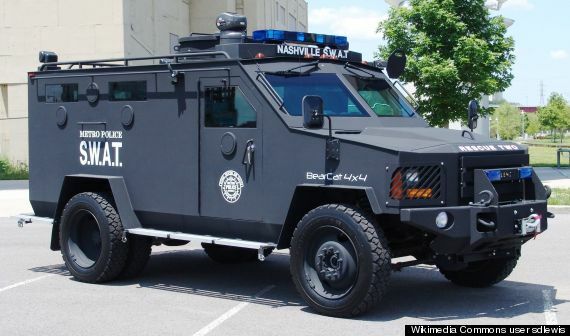 A Lenco BearCat used by police in Nashville, Tenn., similar to one that has been purchased by the Ottawa Police Service. Photo by Wikimedia Commons user sdlewis. 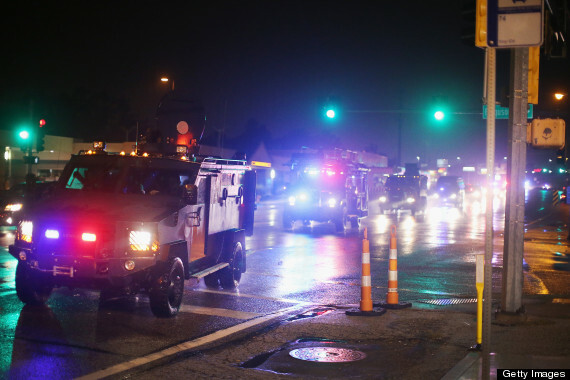 A convoy of armored personnel carriers (APC) carrying county police arrive after Missouri State Highway Patrol officers were taunted by demonstrators during a protest over the shooting of Michael Brown on August 15, 2014 in Ferguson, Mo. All the vehicles donated by the DND have been de-armed before being handed to police, but some believe they send the wrong message. "These sorts of toys do put the public in danger," Ottawa criminal lawyer Michael Spratt told the news service. "They do escalate conflicts. They do create sort of an image problem for the police where they aren't our protectors but they are our oppressors." Proponents of armoured vehicles insist they are necessary. RCMP assistant commissioner Byron Boucher told Postmedia that five of them were used in the hunt for Justin Bourque after a series of shootings in Moncton, N.B. in June. "We’ve had 41 officers killed since 1961 and 83 per cent of them have been killed by rifle or shotgun," he said. "The fact is we still face these kinds of threats — we just faced it in Codiac — and it isn’t going to go away." The trend emerges as the use of military hardware by police in the United States comes under increasing scrutiny. U.S. President Barack Obama has ordered a review of programs that see military equipment doled out to police departments across the country. Obama said there is a "big difference between our military and our local law enforcement and we don't want those lines blurred."